The Multiplier controls the brightness of applied patterns. It is a greyscale image where darker grey is used to suggest shadowy areas, brighter grey for lighter, like the top of ledges. An alpha channel can be used for semi-transparency when the shader supports it. Most shaders support a complete cutout when the alpha channel pixel is black. The rgb channels are used together to provide the grey scale. Save as DXT5 if you need alpha channel transparency, else DXT1 without alpha channel. The Specular controls overall shininess of object. The amount of shine is controlled by the alpha channel. The whiter the pixel, the shinier that area. Black alpha means no shine, white alpha means glaring shine. Color in color channels influences color of shine. Shine of the specular is not a true reflection, nor is it actual light being reflected or emitted. It is a type of graphic effect. Some shaders do not support specular at all, and some objects don't even have a specular compositor, so you'd waste your time making a specular image. The Mask controls how patterns are applied to an object using color to define 3 seperate channels. Red = patternA, Green = patternB, Blue = patternC. An alpha channel is used for patternD (4th channel) when there is one. Some objects are set up so that the channels can blend together where they overlap, ie. where the color applied is not pure red, pure blue, or pure green. 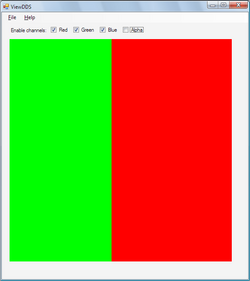 For those that are not set that way, alpha overlays blue, blue overlays green, green overlays red. Mainly pointless. Works like a overlay, and would lay over the top of an overlay. Not all TXTCs support all 4 stencils, and some only support one enabled at a time. The overlay controls non-CASTable texture additions. It is applied over the top of any CASt patterns, but underneath any stencils. Where the alpha channel is white the overlay will be visible and where it is black no overlay will show. Use the color channels to create a normal color image in the area where the alpha is white. It doesn't matter what you do with the areas under black alpha pixels because they will not be visible in the game. 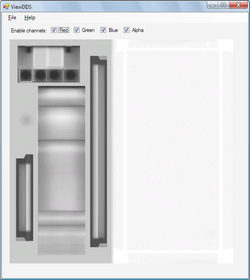 If you do not want an overlay at all, save file size by using a tiny image with black alpha and black picture, or link to EA's default blank overlay. The Mask comes first. All images are subsequently stretched or shrunk to fit the Mask size. If you set it as -1 it will take the actual mask image size, else it will obey your stated mask size and be stretched or shrunk to fit that. Next the patterns from the default preset (the one in the main xml)are applied to mask areas. 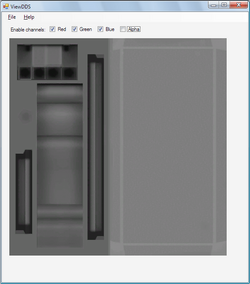 Then the Multiplier greyscale (ignoring alpha channel) is applied to modify the brightness. Then th Overlay is applied, respecting its alpha channel. Then Stencils are applied, respecting their alpha channels. This page was last modified on 14 November 2013, at 10:46.